Figure A. FITC conjugated Mouse anti Rat CD45RA (MCA340FT) and RPE conjugated Mouse IgG1 isotype control (MCA1029PE). 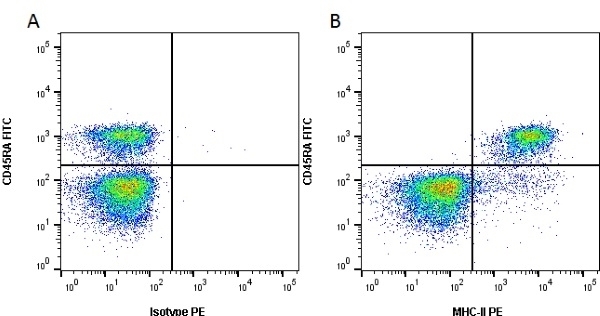 Figure B. FITC conjugated Rat anti Mouse CD45RA (MCA340FT) and RPE conjugated Mouse anti Rat MHC-II (MCA46PE). All experiments performed on red cell lysed rat blood gated on lymphoid cells in the presence of 10% rat serum. Data acquired on the ZE5™ Cell Analyzer. Mouse anti Rat MHC Class II RT1B, clone OX-6 (MCA46R) used for the identification of MHC II expressing microglia in rat retinal sections by immunofluorescence. 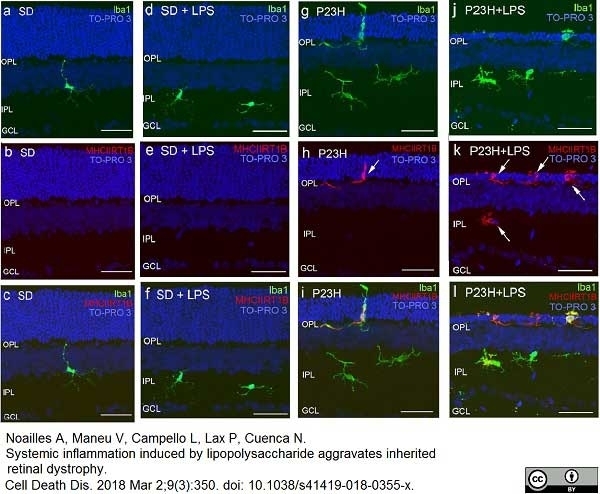 Effect of LPS on retinal microglia in SD and P23H rats. From: Noailles A, Maneu V, Campello L, Lax P, Cuenca N.
Systemic inflammation induced by lipopolysaccharide aggravates inherited retinal dystrophy. Cell Death Dis. 2018 Mar 2;9(3):350. Mouse anti Rat MHC Class II RT1B antibody, clone OX-6 recognizes a monomorphic determinant of the rat RT1B MHC class II antigen present on B lymphocytes, dendritic cells, some macrophages and certain epithelial cells. Rat MHC Class II RT1B antibody, clone OX-6 does not react with the rat BDIX strain due to a defect in RT1B expression (Male et al. 1987). The major histocompatibility complex (MHC) is a cluster of genes that are important in the immune response to infections. In rats, this complex is referred to as the RT1 region. In mice, this complex is referred to as the H-2 region. Mouse anti Rat MHC Class II RT1B antibody, clone OX-6 also cross reacts with a polymorphic determinant on mouse strains of the H-2 haplotypes k and s. Analysis of recombinant mouse strains has mapped the OX-6 determinant to the H-2I-A region (McMaster and Williams 1979 and Male et al. 1987). Mouse anti Rat MHC Class II RT1B antibody, clone OX-6 is routinely tested in flow cytometry on rat splenocytes. 1This product requires antigen retrieval using heat treatment prior to staining of paraffin sections.Sodium citrate buffer pH 6.0 is recommended for this purpose. PLP fixation is recommended for optimal results. McMaster, W.R. & Williams, A.F. (1979) Identification of Ia glycoproteins in rat thymus and purification from rat spleen. Eur J Immunol. 9 (6): 426-33. Fernandez, J.L. & Weeks, M. (1986) Genetic monitoring of inbred strains of mice using monoclonal antibodies to major histocompatibility haplotypes and lymphocyte alloantigens. Lab Anim. 20 (4): 293-7. Charteris, D.G. & Lightman, S.L. (1993) In vivo lymphokine production in experimental autoimmune uveoretinitis. McKechnie, N.M. et al. (1997) Immunization with the cross-reactive antigens Ov39 from Onchocerca volvulus and hr44 from human retinal tissue induces ocular pathology and activates retinal microglia. J Infect Dis. 176 (5): 1334-43. Male, D.K. et al. (1987) Serological evidence for a defect in RT1.B (I-A) expression by the BDIX rat strain. J Immunogenet. 14 (6): 301-12. Burrows, G.G. et al. (1998) Two-domain MHC class II molecules form stable complexes with myelin basic protein 69-89 peptide that detect and inhibit rat encephalitogenic T cells and treat experimental autoimmune encephalomyelitis. J Immunol. 161 (11): 5987-96. J Neuroimmunol. 209 (1-2): 16-25. Kawamura, J. et al. (2010) Neuron-immune Interactions in the Sensitized Thalamus Induced by Mustard Oil Application to Rat Molar Pulp. J Dent Res. 89: 1309-14. Calvo, M. et al. (2010) Neuregulin-ErbB signaling promotes microglial proliferation and chemotaxis contributing to microgliosis and pain after peripheral nerve injury. J Neurosci. 30 (15): 5437-50. McClain, J.A. et al. (2011) Adolescent binge alcohol exposure induces long-lasting partial activation of microglia. Brain Behav Immun. 25 Suppl 1: S120-8. Baca Jones, C.C. et al. (2009) Rat cytomegalovirus infection depletes MHC II in bone marrow derived dendritic cells. Lobato-Pascual, A. et al. (2013) Rat macrophage C-type lectin is an activating receptor expressed by phagocytic cells. Liu, M. et al. (2017) Pioglitazone Attenuates Neuroinflammation and Promotes Dopaminergic Neuronal Survival in the Nigrostriatal System of Rats after Diffuse Brain Injury. J Neurotrauma. 34 (2): 414-22. Noailles, A. et al. (2018) Systemic inflammation induced by lipopolysaccharide aggravates inherited retinal dystrophy. Cell Death Dis. 9 (3): 350.